The one of WordPress site got a wired space when one webpage displayed, When we used inspect tool, we saw a strange character &#65279 there, it was just this strange character was converted to space on a web page. What is the character &#65279 ? Normally there are 3 common “strange” characters: EF, BB, BF. How to remove the character &#65279 ? There are multiple ways to fix the issue. for example: write a java script function to replace the strange character to a empty string. 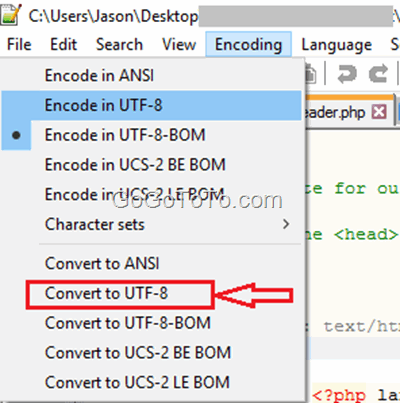 But, we think the most efficient way is using the free tool NotePad++ to convert the original file to UTF-8 (without BOM) format. Menu Encoding –> Convert to UTF-8. After you did the converting, the strange space on web page will gone. How to prevent a page from being copied ?